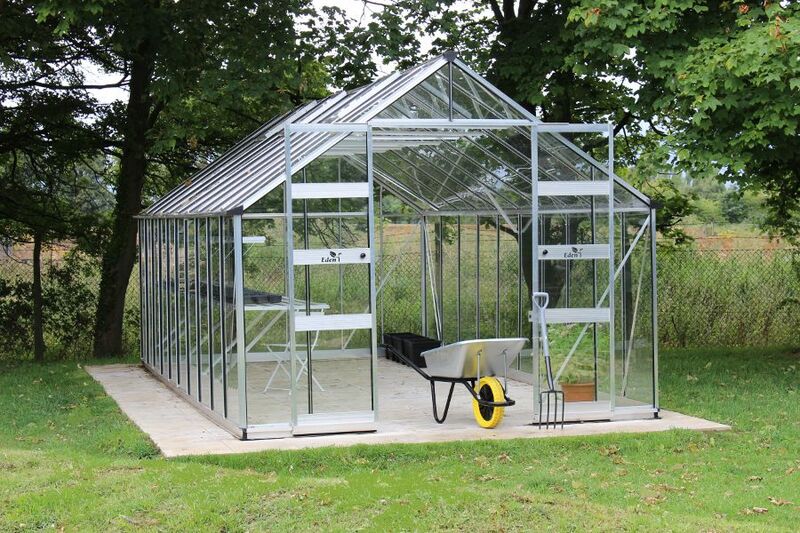 Get in and out of your greenhouse without any worry of tripping over. Easy entry with wheelchairs and wheelbarrows. 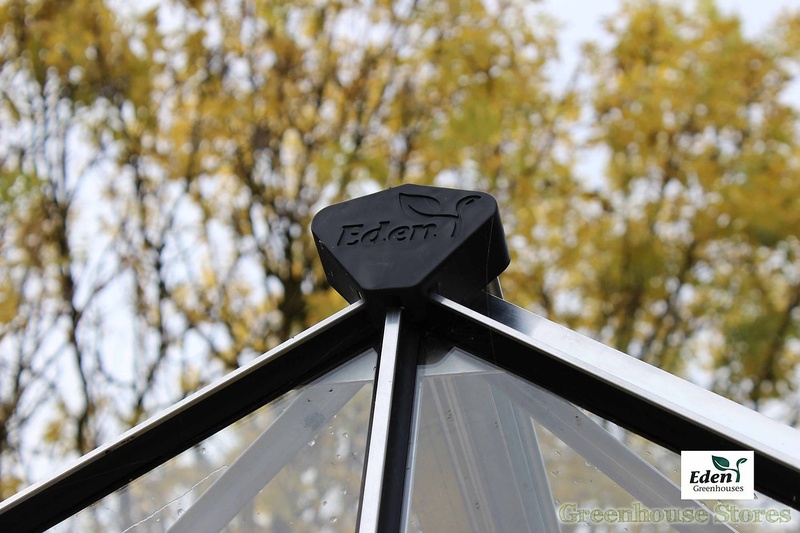 Simply secure your greenhouse to any hard surface with these simple to use L-Brackets, a screw, a washer and a rawl plug. 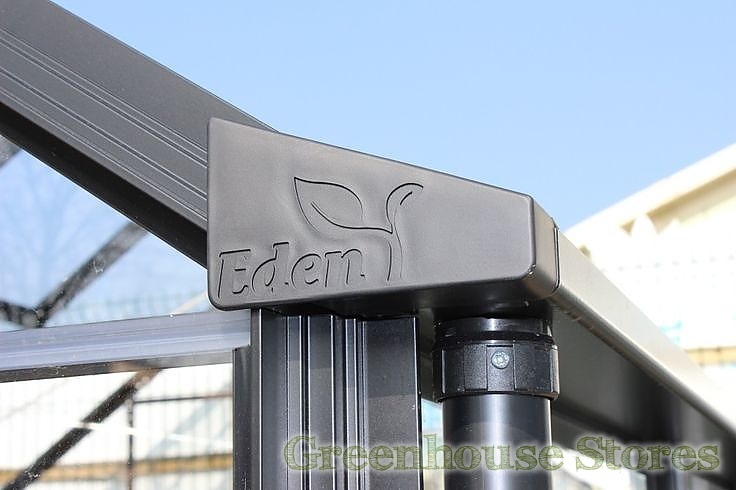 These massive gutters, complete with downpipes are standard features on Eden models. Instructions that are easy to follow provided in packaging along with free rainwater downpipes. Made and packaged in Great Britain. Within 14 - 21 working days (inc. N.Ireland). Offshore and Southern Ireland deliveries please scroll down for pricing. 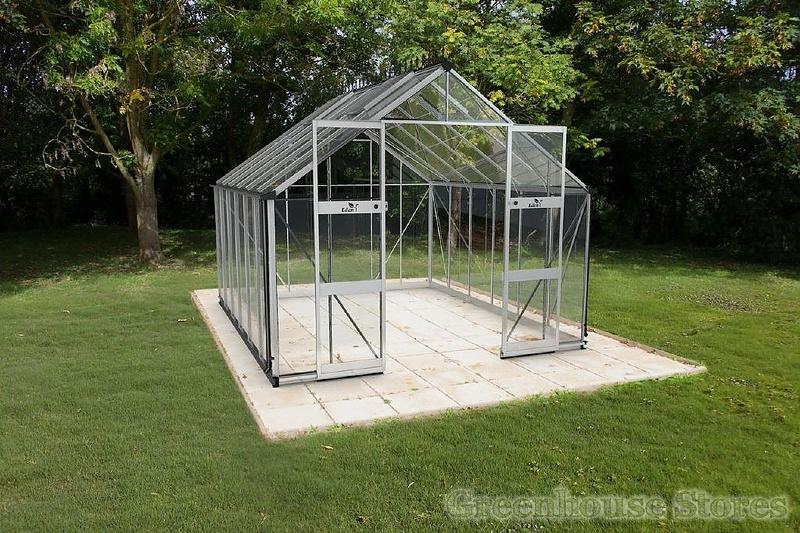 The new 10ft wide Eden Bourton 10x12 Greenhouse is the latest in large greenhouse design. The unique zero threshold ground level entrance make getting in and out simple and safe. NEW - Zero Threshold™ Door System is a first in modern greenhouse design. There’s simply nothing to step over when you enter the greenhouse. No tripping over traditional raised base plinths, and easy access with your wheelbarrow or wheelchair. This system complements the integral base plinth that makes installation fast and easy as well as adding stiffness to the structure. NEW - Wide Gutters with Downpipes make a big difference to the amount of fresh rainwater you can collect as well as help keep them blockage free from fallen leaves. These unique 80mm wide gutters come complete with 40mm downpipes as standard. Along with the tubular ridge bar these wide gutters also add to the overall stiffness of the greenhouse, adding stability in adverse weather. 3mm Full Length Toughened Safety Glass is the very best choice for us UK gardeners. It’s full length, cutting down on drafts and at the same time being stiffer, cutting down on flexing within the frame. Eden use British Standard BS6206A safety glass. This glass withstands impacts far better than standard greenhouse glass and if it does break, it breaks into small harmless pebbles that won’t cause serious injury. 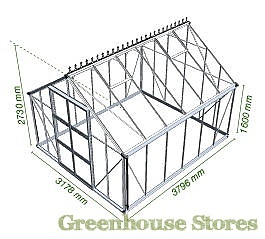 Each greenhouse comes complete with an easy to follow illustrated instruction manual with numbered parts to make home installation easy and straightforward. Add this ornate black cresting to the ridge line of your greenhouse for a more traditional look. Add full length integrated 63cm wide staging to your greenhouse and retain all of your floor space. The 2 slat 12ft aluminium shelf is 18cm wide and is great for smaller pots and tools. Picture shows Silver version. A louvre window is an essential addition to any greenhouse. It is the best way of bringing fresh cool air into your greenhouse without excessive drafts to moderate the temperature and keep humidity at acceptable levels. Excess warm air rises and escapes from your roof vents. This silver louvre vent has 6 slats made from toughened glass that open with a little lever. An automatic roof vent opener or autovent as they are known is another essential purchase. When you are away from your greenhouse and the temperature inside becomes too warm the autovent will open at your pre-set temperature to cool the greenhouse down. Easy and very handy indeed. This clever little mechanism will open your louvre vent for you automatically. If you’re not around and your greenhouse becomes too humid this auto opener will simply open your louvre vent until the temperature is back to the level that you’ve pre-set. This Kit contains enough roller blinds to cover the whole roof of THIS greenhouse. The practical design means that they are fitted in minutes and can be deployed and stowed away in seconds. Simply screw the suckers to the main body of the blind, stick to your glass or polycarbonate and away you go!! 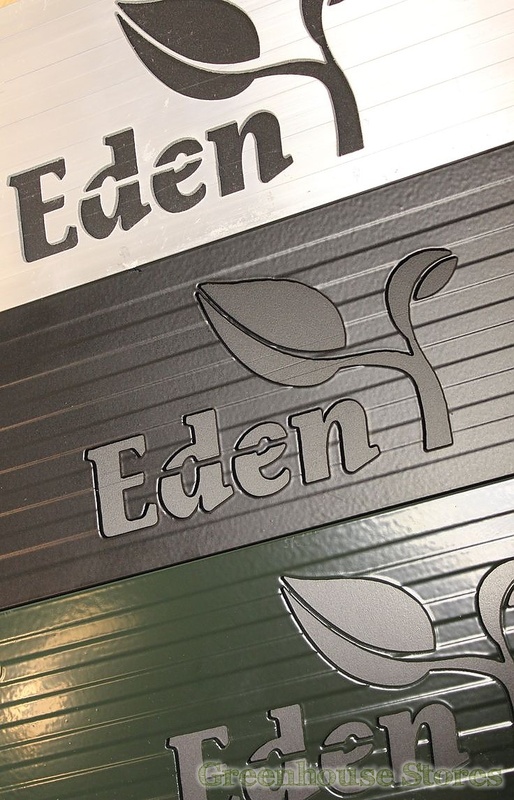 The Eden Roller Blind Greenhouse Shading kits are perfect for any greenhouse with a 2ft pane width. Each pack comes with 2 roller blinds. The shading blinds measure 575mm in width and roll out to 1900mm in length. Total width is 610mm. Each pack comes with 2 roller blinds. 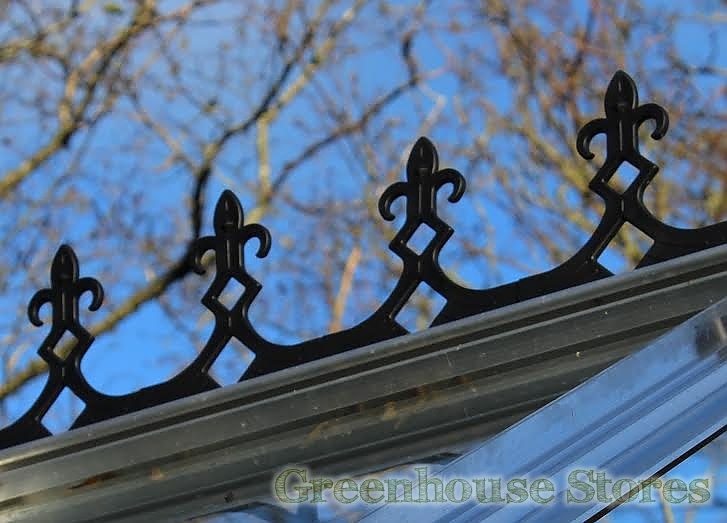 These sturdy steel brackets are designed to hang your plants in your nice warm greenhouse. 10 brackets per pack. The Vanlet is a gravity fed watering system that will keep your plants fed and watered when you’re not around to look after them. Supplied complete with mini hoses and connectors to distribute water all around your greenhouse. 4.4litre Kerosene heater will last up to 18 hours. For greenhouses up to 15m2. A handy Solar powered light with 3 bright LED's which can be used inside and out. Easily slots into your vertical uprights and is great for reading instructions while you work or just listening to some music!!. Great for hanging gloves and tools in your Greenhouse. Pack of 4 hooks with nut and bolts. A Halls Polycarbonate Cold Frame will give you space for seedlings and plants that need the extra warmth and insulation that 4mm twin wall polycarbonate provides. A Halls Jumbo Cold Frame will give you even more space for seedlings and plants that need the extra warmth under glass with easy access from both sides through the sliding lid. Delivery to Isle of Man, Jersey, Isle of Wight, Guernsey and Southern Ireland. Please note that Halls do not deliver to any Scottish Islands apart from the Isle of Skye. Your delivery is to portside only.